Chick Lit Central: Help Susan McCorkindale make her late husband's birthday one to remember! Help Susan McCorkindale make her late husband's birthday one to remember! Wondering what to do with the Amazon, Visa, or Amex gift cards you got at the holidays? Today, February 1st (which would have been her husband's 62nd birthday), please buy a paperback or e-reader copy of our dear friend Susan McCorkindale's new book, "500 Acres and No Place to Hide." Get it for yourself or a friend, and help "bump" up the book's sales rank on Amazon. "For anyone who has faced the illness of someone close, this is a fabulous guide to expertly navigating that roughest of roads. Yes, 500 Acres really will make you laugh. And it really will make you cry. Most of all, however, it'll make you glad that there are authors like McCorkindale to help the rest of us remember just how powerful, life-affirming and healing laughter can be." "McCorkindale shows us that life goes on after cancer, and sometimes, it's still even funny. She manages to stumble over tragedy, confess her writer's block, and then move on with both the book and with life, and for that, she is one of my new heroes." 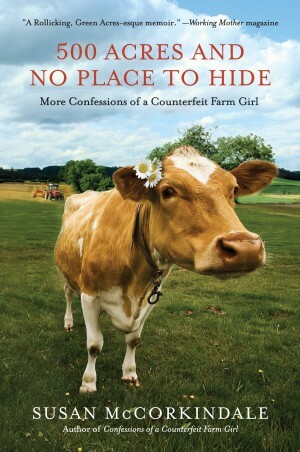 "500 Acres and No Place to Hide ... will just as easily make readers laugh as wipe tears from their eyes." And if you still need a reason to get this fabulous memoir, check out Amy Bromberg's review right here at Chick Lit Central! Please share this post with your family and friends, and please use this link to make your purchase TODAY, FEBRUARY 1st.